Photo(s) by Stormcloud Brewing Co. 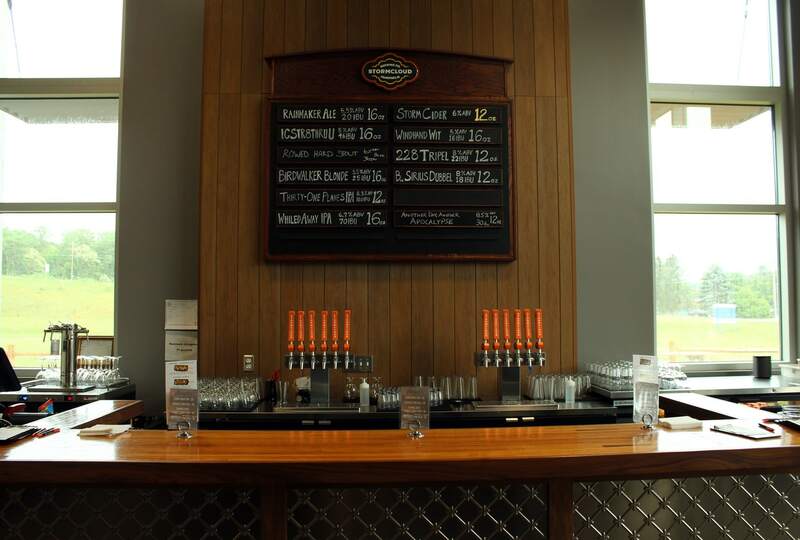 Grab a beer and tour Stormcloud Brewing Company’s new production brewery and tasting room in Frankfort, Michigan. Prior to prohibition, many small-town breweries operated their own saloons, where they sold their proprietary beers. After prohibition, new laws prevented that from reoccurring, and large breweries such as Pabst and Anheuser-Busch, which ship their beers across the country, grew even larger. By the middle of the 20th century, the notion of small-town breweries had become a distant memory. It wasn’t until the 1990s and 2000s that craft beer began to pick up steam with microbreweries and brewpubs opening across the country and state. Still, when Rick Schmitt and Brian Confer decided to get in on the microbrewing trend in 2013 opening Stormcloud Brewing Company in Frankfort, its success was by no means guaranteed. Now it turns out the duo didn’t think big enough. Instead of simply heading their own brewpub, they now oversee a brewing operation that includes a second location (366 Parkview Lane), more than doubling their brewing capacity—with the potential to more than double it again. Not only that, it includes a canning facility and even a second tasting room—all in the small town of Frankfort. Stormcloud 2.0 boasts a tasting room and an outdoor beer garden, which opened for business Memorial Day weekend. Want food with your beer? The tasting room offers some snacks prepared at the downtown brewpub, and patrons are welcome to bring in outside food. It’s also been hosting food trucks including Grow Benzie and Elberto’s Taqueria. Brewery tours are being held on Saturdays and Sundays in July and August. Tours cost $10 and last about 45 minutes. Ages 21 and up get a Stormcloud tasting glass and beer samples, and teens ages 12–20 receive a Stormcloud sticker and soda. Children under 12 are free. Note, reservations are required—you can book online. The new operation can also be used as an event space. Even though hosting a private event means closing the facility to the public, Scott doesn’t see that impeding business. After all, as he points out, there’s another Stormcloud just down the street. Schmitt says the two locations are meant to complement one another. While there’s bound to be some overlap, they try to make sure there are some beers on tap at each location that aren’t duplicated at the other. 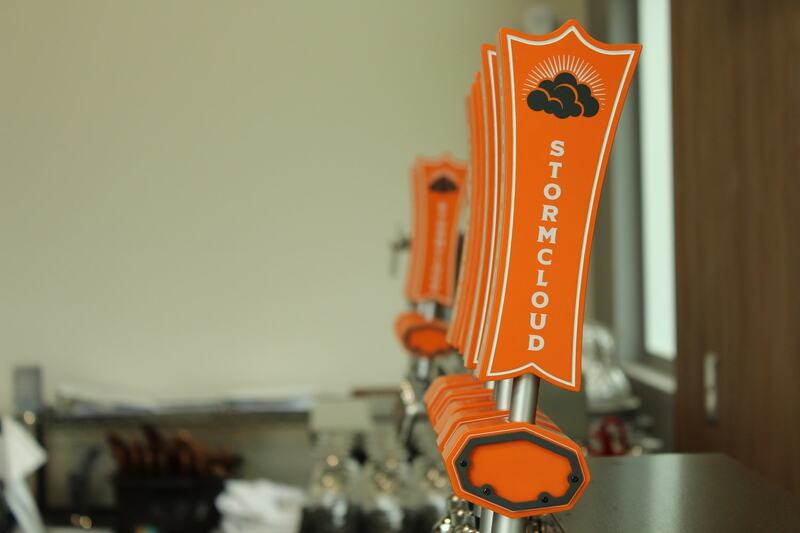 All told, Stormcloud has crafted more than 100 beers since its inception. Keeping up may be difficult if demand continues to increase, and that seems likely. 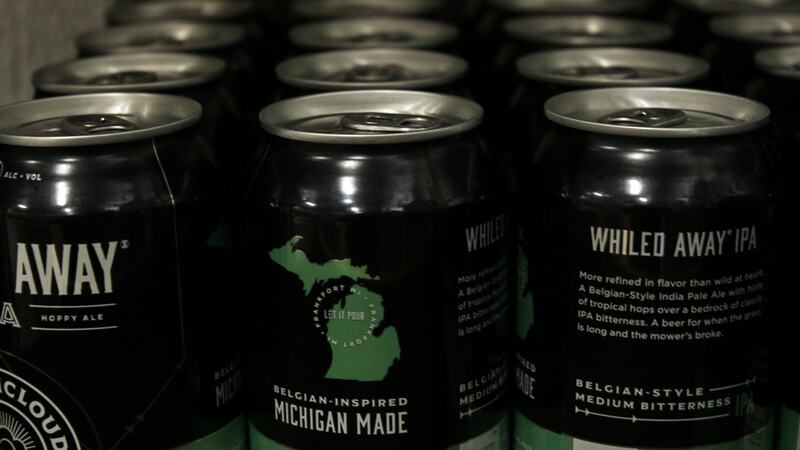 Stormcloud beers are in 19 Spartan stores, Blarney Castle convenience stores, and five Meijer locations in northern and western Michigan. They’re already meeting with the grocery giant about expanding its presence into Meijer stores across the state and additional Family Fare stores as well. Here’s where to find Stormcloud cans. Confer and Schmitt say they hoped the company would be a success, of course, but they didn’t anticipate the rate of growth they’ve experienced. “We are two years further ahead (of where they thought they’d be),” Schmitt says. When they started, they thought the original downtown brewery located next to the Garden Theater (which Schmitt also co-owns) would be plenty big enough for both their patrons and other wholesale accounts. After all, it has a brewing capacity of 1,200 barrels annually. The burgeoning crowds and the popularity of its brews soon made it apparent that they could expand. The new facility, located a mile east, currently has a capacity of 4,000 barrels. Confer says the building offers them room to expand to 10,000 barrels, and if the nation’s thirst for Stormcloud should outstrip that, there’s room on the current site to build bigger. The building itself is a striking blend of industrial, timber frame and mid-century modern, and was designed by Byce & Associates of Kalamazoo. The company is familiar with the brewing industry having provided architectural design and engineering for Bell’s Brewery and Imperial Beverage. While they could simply have constructed a pole barn, which Schmitt says would have been cheaper, they wanted the design to be something that stood out and would engage patrons and passers-by. They even opted to install solar panels along with a number of environmentally friendly systems such as LED light fixtures and two electric car charging stations (Tesla and generic), which will be available this summer. Visit the Stormcloud Production Brewery and Tasting Room at 366 Parkview Lane.